Patricia Highsmith’s psychological thrillers probe the twisted minds and lives of people who adopt an oblique approach to what most would call reality. (Carol, which I posted about last summer, is different.) In Edith’s Diary we are back in the world of disquieting mental states in a deceptively tranquil domestic setting in the nineteen sixties and seventies. Brett and Edith move from the city to a sleepy Pennsylvania suburb to enable their son Cliffie to grow up in a healthier environment. Big mistake. It’s not the city that’s unhealthy. Aged eight he tries to smother the family cat. At ten he jumps off a local bridge into the river below – twice – and is fortunate to be rescued. Sullen, contemptuous and uncommunicative, he clearly has mental health problems way beyond the usual adolescent truculence. As the novel develops Cliffie emerges as something of a psychopath, cruel and unsympathetic to those around him, and with murderous tendencies. As a boy he watches the collapse of his parents’ marriage with detached curiosity verging on pleasure: if he’s ‘not normal’, what are they? She’d felt better after getting that down on paper. Such an attitude wasn’t phony armor, she thought, it was a fact that life had no meaning. One simply went on and on, worked on, and did one’s best. Edith couldn’t imagine a man thirty-five or so not getting married, if he could afford to, because it was so convenient to have a wife, he wouldn’t be here now, for instance. Highsmith astutely handles Edith’s incongruous mixed-up thoughts in order to expose the hypocrisies and inequalities in a complacent patriarchal society which Edith lacks the strength or clarity of mind to confront head-on. It’s apparent that the newspaper she co-edits is received with either indifference or contempt in her community, and it becomes as trivial and banal in its editorials as its target audience. Edith in her diary fabricates an alternative existence in which Cliffie goes to Princeton (he’d flunked all his exams or cheated and been exposed), and becomes a global executive in an elite engineering firm. As the indolent young man in the nightmare real world becomes a violent alcoholic parasite, ever more antisocial and unhinged, she cranks up the perfection of this imagined world of her diary: she marries him to a trophy Wasp, gives him two adorable children and they all dote on her. These fantasies serve to heighten the sense of foreboding and horror of what’s really going on under her roof: ‘it was pleasant and reassuring to imagine’, the narrator confides at one point as Edith invents a happy wedding for misfit loner Cliffie. As the gap between ugly reality and her own delusions widens, Edith becomes as deranged as her obese, monstrous son. Brett had been a leftist journalist, while Edith produced a local free paper in which she could write fervently liberal anti-Vietnam War polemics – but her mental collapse is accompanied by an alarming swing to authoritarian conservatism which alienates her few friends. She loses her job as a result of her increasingly erratic behaviour. This is an unsettling, meticulously constructed exposure of a dysfunctional family – all of whom are damaged, deluded and self-deceiving in their various ways. They could be seen as a metaphor for the disintegration of fragile liberal American values at the time. I wonder what Highsmith would have made of the present post-truth world. It’s not possible to say it’s an enjoyable novel, given its uncomfortably disturbing subject matter, explored with unflinching forensic attention by Highsmith. But it’s gripping in a car-crash sort of way. 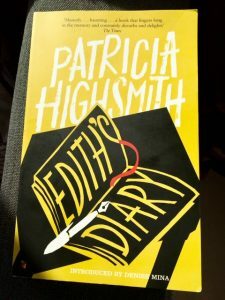 This entry was posted in American Literature and tagged Edith's Diary, Patricia Highsmith, Psychopathy, Vietnam War, Virago Modern Classics by Simon Lavery. Bookmark the permalink. I’ve always thought of Highsmith of a somewhat dark novelist, but this sounds pretty bleak. I’m not sure I want to burrow this deep into the dysfunctional family it portrays, though sometimes you just can’t look away…. Karen: it is pretty bleak, and at times I considered giving up on it. As you say, I just couldn’t look away. I have a couple more Highsmiths on the shelf – another of those bargains from the Book People – but may have to recover equilibrium before I re-enter her twisted world. Yes! You definitely need some time in the sunshine before diving back into Highsmith’s world. What fascinates, though, is her admitted brilliance and clear-eyed poking about in the darkest nooks and crannies of humanity.